I’ve always thought there was something classy, and even romantic sounding about the word “ganache”. Maybe that’s why hanging out at Disney Spring’s new “Ganachery” during their upcoming Grand Opening Tuesday with all the other “cool kids” from Disneyways sounds like the really swanky thing to do. If you have never experienced the heavenly mixture of melted gourmet chocolate and cream you don’t know what you are missing. Thankfully, The Ganachery will showcase SIXTEEN in-house made varieties of this decadent treat, so you can quickly acquaint yourself by sampling flavors like their signature Florida orange dark chocolate. In addition to their unique array of ganache flavors, The Ganachery will feature other house-made chocolate confections for the discriminating palate which will be wrapped in fanciful little packages, as well as nine unique flavors of chocolate bars designed to pay homage to Disney Icons and Destinations. Disney Pastry Chef, Stefan Riemer, who has passionately searched for the best chocolate worldwide, has professed that the quality of chocolate will be akin to that of fine wine. To this end, a knowledgeable chocolatier will greet guests and an expert will be on stage fashioning the edible works of art as visitors observe. This sounds like the makings of a fabulous date-locale…which may be why MouseMingle.com, has sponsored door prizes and goody bags for this much anticipated Disneyways Opening Day Meet Up. MouseMingle.com is the ingenious online site that has combined the merits of online dating with the Magic of Disney, aspiring to help Disney fans near and far make romantic connections through their mutual love of all things Disney. You won’t want to miss this event, which has all of the elements of both class and romance, just like it’s name would suggest. Anyone wanting to join should arrive at 2pm on Tuesday, December 15th 2015. Goody-bags are limited, so don’t be late. The Ganachery is located in the Landing Section of Disney Springs near favorites like the Boat House and Joffrey’s Tea Traders. A note from Krista: Please be advised that prizes and goody bags are available only while supplies last and you must be present at the meetup to win. MouseMingle.com has provided a donation to help offset the cost of these prizes but this is NOT a singles meetup. Everyone is welcome! Please visit the event facebook page or contact me (Krista) with any questions. Comments left on this blog post may not be seen in time. Thank you!! Kimberlee Thompson is a Central Florida Native who has grown up “Living the Dream”. She has completely lost count of the number of times she has visited Disney Destinations and she considers herself very blessed to be able to say that. Kimberlee continues to reside in Central Florida with her husband, also a Florida native, and her two children. Disney Ways is PR Friendly and welcomes product reviews, giveaways, sponsorships and other promotions based on companies and products that would be beneficial or of interest to Disneyways readers. Krista is native to Orlando, Florida. She is a former cast member, has 20 years of experience in marketing, is open to travel opportunities and advertising. As heard on Randy Crane’s Stories of the Magic – Episodes 98 and 99! Requests for reviews, promotions, guest writing, or site statistics may be directed to disneyways@disneyways.com. Krista is most easily reached on Twitter and Facebook. and the Gluten and Diary Free WDW newsletter. She is a a contributor to ChipandCo.com. Disneyways.com is listed on TheBestofDisney.com blog directory. Krista Joy Enterprises, Inc. Dream Team!! The Disney Parks Podcast blog features content created by the Krista Joy Enterprises Dream Team and is listed in the TheBestofDisney.com blog directory. 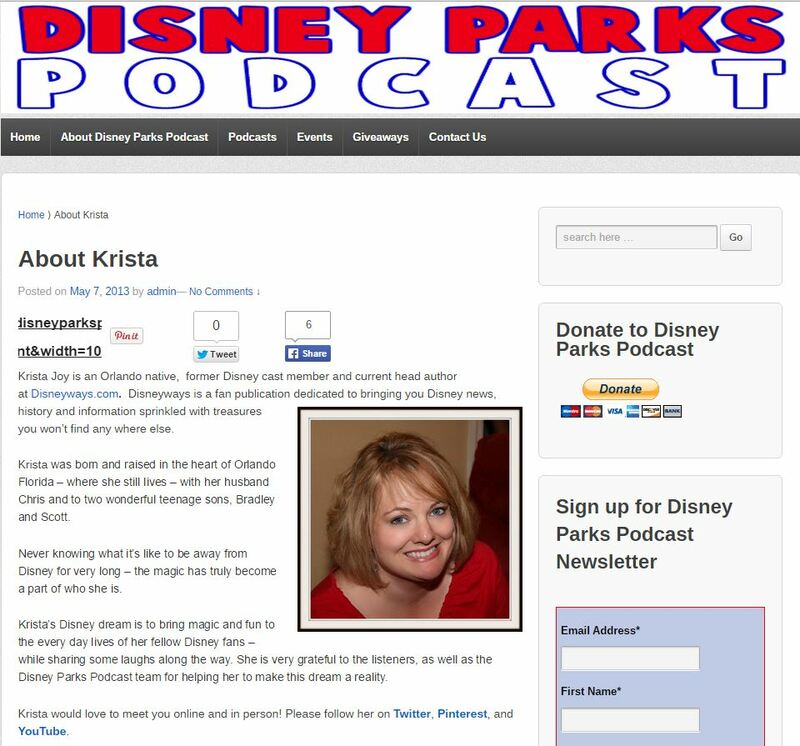 Krista was a co-host for the Disney Parks Podcast for over 150 Episodes ~ from May 2013 to June 2015! She was essential to many of the meetups, newsletters, booking of celebrity interviews, organizing blog post contributions and MORE during the time she was with the show. Episode #200 is where you will hear the current hosts talk about how she made improvements to the Disney Parks Podcast, and brought it to a whole new level. At the time this was written, Disney Parks Podcast was still re-tweeting and re-sharing many of the 150+ episodes that Krista was a part of. She had a blast growing and improving her skills with this show, but is thankful for the chance to enjoy new beginnings and interviewing all of her Disney celebrity friends again (and more!) on LivingTheDreamPodcast.com. Krista was featured and interviewed as one of the people “shaping Orlando’s community”on Episode 7 of the Orlando Waterhole Podcast. Show host Ben Reed invited her back to be included as resident Disney World expert on Episode 20. Kyle and Chris from the Wonders of the World Podcast had Krista on to discuss enjoying the parks even on those extra crowded days! You can check out this podcast HERE. The Home Based Travel Agent Podcast invited Krista on to share her love of Disney and tips for selling Disney travel from a guest’s perspective. You can check out this episode HERE. Joe Pardo of the Dreamers Podcast featured Krista as one of his guests who are living their dreams and inspiring others to live their dreams too! You can check out this episode HERE. Joe invited Krista back to talk about how just being friendly can change your life! Cheryl from The Mighty Mommy’s Quick and Dirty Tips for Practical Parenting recently mentioned Disneyways and Disney Parks Podcast as two of her favorite resources of Disney information on episode #290. Check out Cheryl on the Mighty Mommy Podcast HERE. ReputationManagement.com quoted Krista in the Expert Guide to Building Trust Online. They guys from the Enchanted Tiki Talk Podcast welcomed Krista as a guest to talk about eating at Magic Kingdom on $40 a day. You can listen to this episode HERE. The MakupBlogginDiva.com inquired about Krista’s eye makeup routine! Please check out the full article HERE. As seen at MegaCon 2015!! One of my dreams came true this month. Since I wasn’t able to take you all with me, I have been wondering how in the world I could put it in to words in an attempt to convey what it was like. I’m just a regular person – not really special in any way (the Skyway Film Festival was open to the public!) but, I felt very privileged and honored to “walk on the red carpet” in June of 2015 for the World Premiere of the film, Walt Before Mickey. Not only was I able to check this once in a lifetime experience off the bucket list – but it also involved Disney. Somebody pinch me! I want to thank my good friend Adria, President of the World Chapter of the Disneyana Fan Club, for sending over these questions regarding the recent movie premier that several of our club members attended Walt Before Mickey. Her email inspired me with a format to put all of this together in words and pictures for you today. As a reminder, this film is based on the book “Walt Before Mickey” and covers the early years of Walt Disney’s career. Shot in Florida, Walt Before Mickey, which stars Thomas Ian Nicholas, Jon Heder, David Henrie and Jodie Sweetin, chronicles the life of Walter Disney from his childhood in Missouri to his start as an animator. Directed by Khoa Lee as his first feature length film, this amazing movie is based on the book by author Timothy S. Susanin- and forwarded by Diane Disney Miller (Walt’s daughter). 1.) What was your first impression when you arrived at the premiere? The Manatee Performing Arts Center is spectacular, newly remodeled, and comfortable. A very nice lady on staff explained to me that this chandelier is an original – used in the film Gone With the Wind! This beautiful, important fixture looked right at home in this space. 2.) Was there a lot of pomp and circumstance? Yes, I thought so. The door was held open for us by gentleman in elaborate costumes, looking much like the one Ponce de León may have worn when he discovered Florida. What a nice touch! 3.) Where there a lot of people? How many would you estimate? Yes! I have read that there were 500 people there. 4.) Did you get to meet the producer, director or any of the actors or actresses? Yes. I have known Arthur L. Bernstein and Armando Gutierrez (Executive Producers) for quite some time. We have communicated by phone, facebook, and I have interviewed them in the past. Meeting them in person and getting to hug them (finally) was like seeing old, familiar friends. 5.) What did you think of the movie? I LOVED this movie. 6.) What did you like? The actors did an amazing job and there was SO much attention to detail. The authenticity was incredible. Much of the clothing really was from the early 20th century and great care was taken to care for these costumes. We were all amazed to learn that it was filmed so close to home. What didn’t you like about it? I know there is a lot of red tape involved, but I would love to see this movie be released nation wide. Every Disney fan should see it. 7.) Any other thoughts you’d like to share? I am just so thankful for this beautiful evening, all the new friends I have met, and how kind everyone was. 8.) If an opportunity like this present again in the future would you like to attend? In a heartbeat! Disney news, information, tips and advice! Interviews with some of your favorite Disney celebrities AND correspondents! Prizes, contests and meetups! This podcast has got it all! We are adding some new avenues to bring you more Disney magic and we hope you will come join in on the fun! Podcasts are multimedia digital files made available on the internet for downloading to a portable media player or directly on your computer. It’s like a radio show that you get to listen to whenever you want, such as when you are on a walk or driving to work. There are podcasts on just about any subject imaginable – and Disney is one of the best subjects out there. Thanks to my friends John Donahue from WDWParkHoppers.com, his beautiful wife Parkhopper Sid (Sarah I. Donahue!) and Tony Caselnova of DisneyByTheNumbers.com – I have been invited to co-host the Disney Parks Podcast. In addition to being on the air, I am having a blast helping to organize the meetups, assisting with social media, writing scripts, working on the website, and administering contests! There is so much to do, and working together has been awesome. We have enjoyed some wonderful feedback from our listeners and friends! I think you will find we are accomplishing great things as a team. My co-hosts are SO much fun, but also tremendously knowledgeable about all things Disney. I am always in a good mood and feeling great during and after each podcast. I hope you will tune in and enjoy the same! By the way…we’ve had some amazing Disney celebrity interviews on the show recently. Podcasting has been on my list of things to do since I began blogging here at Disneyways, because it fits in to our mission and goal to bring you Disney magic where ever you are! I can’t begin to tell you how thankful I am to the DPP team for this wonderful opportunity. I truly love being a part of the many different facets in front of the mic, and behind the scenes. The show has been very successful and has a large audience, but if you aren’t yet listening in – we need YOU! Most Disney fans are aware of the fabulous Disney Food Blog. Head author and creator AJ Wolfe and her team are a WONDERFUL source of information and photos – and we love linking back to them here at Disneyways. You may have noticed, we do it quite often! AJ has released a fantastic new ebook that the whole world needs to know about, so I have asked her to share more about it here on Disneyways. Am I star-struck? Um, YEAH! Just a bit. I thought about it – and in doing my best Barbara Walters impression I realized – I don’t want to ask her the same questions everyone else does. I want to ask her YOUR questions. So what do you want to know about the Disney Food Blog Mini-Guide to Magic Kingdom Snacks? Over the next 24 hours I would like to collect your questions! So don’t delay – and leave them in the form below! If your question is chosen, your first name, last initial and hometown will be posted here on Disneyways.